The Discoverer Series of maps by the Ordnance Survey of Northern Ireland are set to the Irish Grid system. Each map covers an area of 40km x 30km and the contours are spaced out at 10 metre vertical intervals. There is an overlap between adjacent sheets to provide extra detail surrounding borderline locations. On the back of each sheet is a townland map and index. 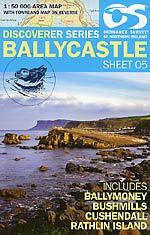 Two-thirds of the eastern section of the Causeway Coast Way is covered on the Ballycastle Map (Sheet 05). The part of trail covered begins from Ballycastle and continues as far as Dunluce Castle, to the west of Portballintrae. The villages and communities that are inbetween include Ballintoy, Portbraddan, Dunseverick and the Giant's Causeway. The popular tourist town of Bushmills is also featured.